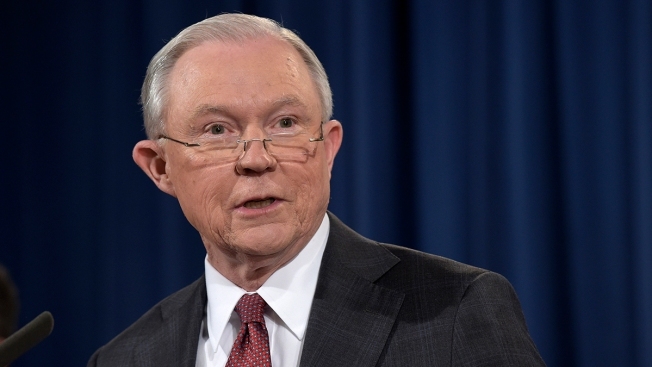 Attorney General Jeff Sessions says a mix of prevention and enforcement against the transnational gangs bringing drugs into the country is critical to turning the tide against the rising rates of addiction in the country. Making a surprise appearance at a summit on opioid awareness for middle and high school students in Manchester, New Hampshire, on Tuesday, Sessions recalled his days in the 1980s as a federal prosecutor when "drug use had surged" and "cities were filled with heroin addicts." Sessions said authorities were able to reduce drug use through education and that it could be done again. He also said authorities needed to do more to combat the overuse of prescription drugs and target drug gangs. Treatment, he said, also was a tool, but often came too late after addicts have lost their jobs and families.